As we continue to examine the NBA’s list of top free agents, we’re convinced, now more than ever, that the 2016–17 season will feature a lot of turnover. This isn’t just about players joining new teams, this is about the possibility of a shift in the balance of power in the NBA. Brace yourself, sports fans, this could get ugly. For some NBA teams, change will turn out to be a good thing. For others, not so much. In the end, it will come down to which of the top players in free agency decide to stay, and which determine that the best course of action is to go. Until that time comes, all we can do is make an educated guess, predicting how we envision this all playing out. The way we see it, come next season, these nine teams are in serious trouble. The Thunder finished the 2015–16 season with a 55-27 record, a Northwest Division crown, and one victory away from a trip to the NBA Finals. So why does this talented and athletic group fall on the list of teams in serious trouble next season? Two words: Kevin Durant. As the biggest prize of the free period, the former MVP holds the fate of the Oklahoma City franchise — and its fans — in the palm of his hand. Should he opt to take his talents to anywhere from Golden State to San Antonio, the Thunder organization will be forever changed. Of course, if K.D. decides to stays put, then we can scratch the Oklahoma City Thunder off this list. We wait with bated breath to see how it all plays out. After getting swept out of the NBA playoffs for the second straight year, the Atlanta Hawks find themselves at a bit of a crossroads. This upcoming season could see the franchise take a major step back — and we think that’s exactly what will happen. It’s too soon to know whether or not the Jeff Teague and George Hill swap will work out in Atlanta’s favor, however, it’s safe to say that if Al Horford bolts this summer (he has plenty of suitors), then the addition of Hill won’t make any difference. As we said before, this group has already been bounced from the postseason with relative ease over the last two years; losing its best player would be an absolute nightmare. Just when it appeared as if the Charlotte Hornets, who finished last season with a 48-34 record and earned the No. 6 seed in the Eastern Conference, were turning a corner, there’s a strong possibility the club will come spiraling back down to earth next season. Such is the potential pitfalls of free agency. Signing swingman Nicolas Batum is the team’s No. 1 priority (he wishes to return as well), as is bringing back Marvin Williams. However, because of the cap space these deals will most likely eat up, the Hornets have to brace themselves for the possibility of losing point guard Jeremy Lin. While this is not something Charlotte wants to happen, it’s a reality the organization must face. Nothing stunts a team’s momentum quite like the dismantling of a core group of players who were just beginning to develop chemistry. It’s hard to imagine a Dallas Mavericks team without Dirk Nowitzki, but given his free-agent status, that’s exactly what we could be looking at next season. Of course, while the likelihood of the 38-year-old jumping ship is pretty slim, it’s still something we have to acknowledge — no matter how much we don’t want to. On top of that, the Mavericks could lose Chandler Parsons in free agency. Considering the team’s lack of youth, this would be a disaster. Still, even if this group manages to keep all of its free agents from bolting, the Mavericks aren’t going anywhere until they address their glaring hole at center. For the record, the addition of either Dwight Howard or Hassan Whiteside could change all that. Just saying. Injuries played a major part in the decline — by their standards — of the Memphis Grizzlies in the 2015–16 season, but even with a healthy roster, the team could face a trying time come next season. We have to assume that things look different under first-year head coach David Fizdale, but that’s far from the club’s biggest concern. When it comes to the Grizz, it’s all about Mike Conley. In a weak free-agency class for point guards, the former Ohio State Buckeye will be the most sought-after floor general this summer. If he leaves Memphis, then this group is in big trouble. Conley is steady, smart, reliable, and all grit; he is what this Grizzlies team is all about. No wonder the club is doing all it can to get him to stay. We’re excited to see what a team made up of Paul George, Myles Turner, and a newly-acquired Jeff Teague can do on the court together. This is a solid core that should help the Pacers continue their quest to become an offensively dynamic team. Unfortunately, in our opinion, Indiana will enter next season already devoid of a major piece of the puzzle — and it was the organization’s own doing. We’ve said it before and we’ll say it again, we think the Pacers were foolish to fire Frank Vogel. The guy is easily one of the best coaches in the entire NBA, and we truly believe his presence will be missed. We just hope Larry Bird knows what he’s doing; this one’s on him. Although Dwyane Wade enters the summer as a free agent, he’s practically the mayor of Miami, so it’s safe to assume he will sign another extension with the Heat. The same, however, is not a foregone conclusion for the man who patrols Miami’s paint. Every team with a clear need at center will make a play for Hassan Whiteside. He’s young, he’s a shot-blocking machine, and his upside is undeniable. If he leaves, the Heat could be looking at a challenging 2016–17 campaign. Then again, given the uncertainty surrounding the health of All-Star Chris Bosh, Miami could be in trouble either way. The Houston Rockets were among the most disappointing teams this past season, and quite frankly, it’s inexcusable. This team had too much talent on its roster to settle for a 41-41 record. Considering the turnover that’s probably going to happen, we can’t see next season going much better. By opting out of his contract, Dwight Howard sent a clear message: He’s gone. Try as they might to change his mind, the Rockets should just accept this, move on, and hope to fill the void with a viable replacement. With new coach Mike D’Antoni at the helm, we fully expect the Rockets to run the floor, pick up the pace, and put points on the board. As for playing defense, well, let’s be real — they never did that to begin with. After trading Derrick Rose to the New York Knicks, the Chicago Bulls are now officially Jimmy Butler’s team (unless, of course, they end up trading him). 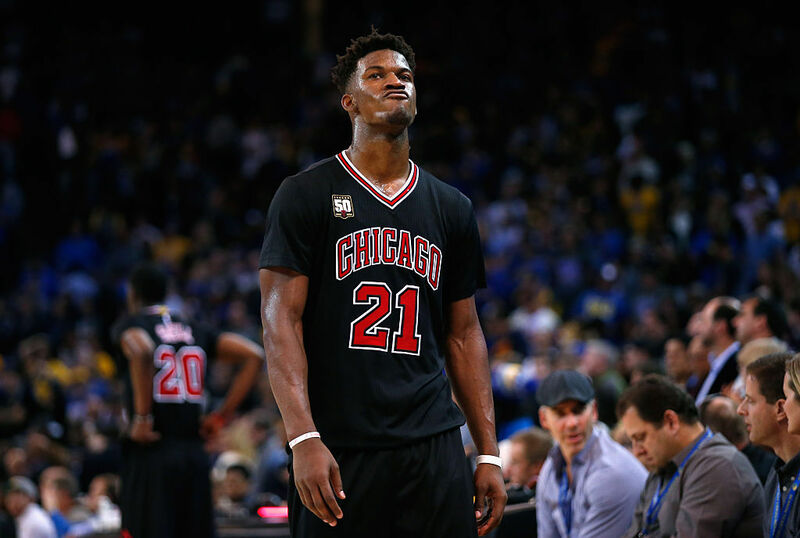 But for argument’s sake, let’s just say that Butler remains in the Windy City. Then the real question is who will be joining him? Rose is gone, both Pau Gasol and Joakim Noah are free agents (it wouldn’t surprise us to see them each with different clubs next season), and head coach Fred Hoiberg can’t even get his players’ names straight. This is not an easy time to be a Chicago Bulls fan. And we think trouble is here to stay — at least for next season.